Panna cotta is one of my favorite desserts: for months I tried to find a panna cotta recipe that did not contain disgusting commercial gelatin of animal origin (have you ever wondered what they put in it? You should! ), or strange powders based on algae that, I can honestly say, I never knew how to use and … well, I finally found it! 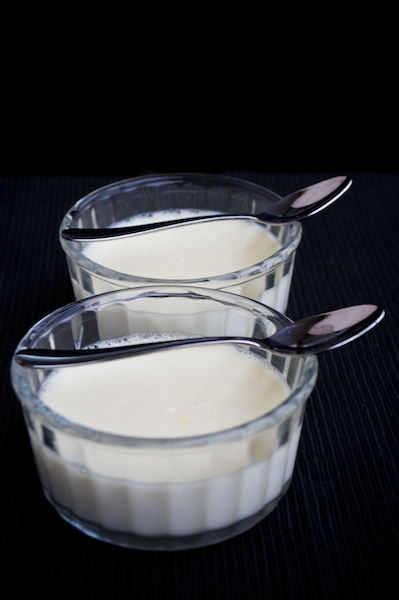 This panna cotta is the most traditional, simple, and natural panna cotta around. No powders, no gelatin… nothing that is not simply cream, sugar and eggs; this is the true panna cotta! The recipe that I propose is not only healthier than others because my panna cotta has no “strange” or artificial ingredients, but it is also very simple: you won’t know till you try! In a saucepan bring the cream with sugar, honey, and vanilla pod horizontally scored to a boil, and cook until the sugar is completely melted. In a large bowl, lightly beat the egg whites with a fork until you get some bubbles on the surface. Add the warm cream to the egg whites taking care to remove the vanilla pod, then pour the mixture into the appropriate single-serving oven-ready ramekins. Fill a baking pan with water and place the small ramekins in the pan. Be careful! The water must reach the level of the cream but not the edge of the bowls. Place the pan in the lower part of the oven preheated to 120°C, and bake for about one hour. The baking time depends somewhat from the oven and the amount of panna cotta, however, you can check if the cream is ready simply by touching the surface, which must be elastic but compact. Let the panna cotta cool, and transfer it to the fridge, where you will keep it until ready to serve. In my opinion, the panna cotta is delicious on its own, as is, but you can let your creativity fly, by accompanying it with fruit sauces, with chocolate creams, caramel, and so on.